In my role as Young Water Expert I am working as a coordinator and technical assistant for World Waternet at the Gourma water board in Burkina Faso. The water board is working on the integration of water resource management in eastern Burkina Faso. It is my task to coordinate the acquisition, processing and interpretation of data, and to facilitate trainings on hydrogeology and geophysics. I will improve cooperation between Dutch and Burkina Faso water organizations. 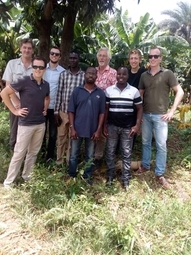 A part of my activities is to share knowledge about geology, hydrology, remote sensing and geophysics and to support/supervise Dutch students with their internship activities in Burkina Faso and to share my experiences. I am also supporting employees of the Dutch Water Authorities with tasks for the project Faso Koom, which focuses on water governance, the establishment of local water committees, the development of water management plans, the set-up of water monitoring programs and the introduction of water taxes.